Though you would never guess it by the groaning foam of their music, Animal Collective are huge fans of simplicity. Over the course of nine years, they’ve built a career on small, gravelly desires: chores, summertime, domestic life. These are not the things your typical experimental pop groups sing about, and Merriweather Post Pavilion is no exception to their rule. Animal Collective are a snowglobe unto themselves, ushering us through a world where flakes fall, where we can only see the details through ever-shifting fractals. It’s a strange and enviable thing, this world that exists within Animal Collective. It is a world that is utterly oblivious to the neon blue hype that Merriweather Post Pavilion has already received. Actually, that’s too much of a simplification. It’s not that Animal Collective are unaware of the scene and its fiber-optic nausée; it’s that they’ve rejected it, insisting instead on the beauty of the real world of children and Saturday mornings and front lawns. In this way, Animal Collective are something of the first post-hipster band, a group of guys who gave all they had to Planet Indie Rock and aren’t afraid to admit that the whole thing is mostly soft plastic. Which isn’t to say that there aren’t times when they aren’t tempted to return to the beauty pageant. Throughout Merriweather Post Pavilion, both Panda Bear and Avey Tare groan at the distance between these two worlds. Opener “In the Flowers” starts simply enough, with what sounds like a keyboard being repeatedly dunked underwater while Tare sings about trying to leave his body when the music suddenly explodes in rhythm, with something like four separate drum machines and the thump of live drummers threading in and out of one another, each rhythm taking the lead while the others melt and twirl together, trading off the lead so expertly that we don’t even sense the shifts. This is what Animal Collective have always done well, and are suddenly doing exceptionally well — they usher us into the kinds of places that we never thought we’d find ourselves, and half of the time we don’t even realize that we’ve gone through the wardrobe. Much has been made about the influence of Panda’s solo Person Pitch on Merriweather, and while Tare’s “Summertime Clothes” does sound like a more organic version of “Take Pills,” Tare’s vocoder-laced vocals and Panda’s sunkist shouts fit together with more precision than either can muster alone. And while it has become de rigeur to say that Animal Collective are only extending the work that the Beach Boys began on Pet Sounds and Smiley Smile, Brian Wilson and his brothers never experienced with the minor-key tonal shades that shine a fierce sun upon nearly every track here. Despite living on two different continents (Panda in Portugal and Tare in Manhattan’s Chinatown; noise processor Geologist lives in D.C.), Animal Collective feel more and more like a cohesive unit. At their root, these are all very, very simple songs. “Summertime Clothes” is about hanging out in the summer. The outstanding “My Girls” is about buying a house. These are meditations on calm, quiet, and altogether normal life. As if to clear up any doubt, there’s even a track called “Daily Routine.” But each thought and prayer is dressed up with the true importance and beauty that can be found only in small things. Geologist sends filtered water splashes through the mix. People chat. Doors creak. Things happen. They are small. They feel big. And really, what the Collective are doing is growing up. They’ve spent their time in the big city, they’ve smelled its smokes, and they’re setting up their own homes. And what they’re doing with the dissonant foregrounds and the at-times overwhelming beauty of the foregrounds is describing that very process, the swelling and groaning and absolute sweetness that comes with settling down, the excitement at not taking things so seriously and the ache to return to the world where popularity counts. There’s caramel at the center of all of this. 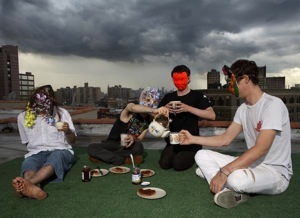 + Download Animal Collective via eMusic’s no risk 25 Free MP3 trial offer. I do enjoy the album a lot, however I find it one step below Strawberry Jam. This album is a little too-Panda Bear influenced. It doesn’t have the overall tenacity which gives Animal Collective the “animalness” about them. Sure there are moments of absolute brilliance, Summertime Clothes, Lion In a Coma, Brothersport, and My Girls are testament to that. But this album has one too many summery tracks for me. I am currently listening to Merriweather Post Pavillion. I am immenly amazed. Merriweather Post Pavillion (in addition to Antony’s Crying Light and Bon Iver’s Blood Bank EP) is one of my most anticipated releases of the year. On Merriweather Post Pavillion, Animal Collective transcends multiple boundaries and massacres the term genre – with subtle influences of indie rock, electronica, and what not. Since today begins a new United States (Obama is the best thing to happen in years – a needed change to represent the voice of real people), let us begin a new chapter in music (no, I do not want indie rock to become obsolete – I’m a big fan, but I do want mainstream music to disappear). I still can’t get into them, despite numerous tries. That being said, that is an excellent review, absent all the mindless fawning. I still don’t get it. I’ve tried and tried to hear what people are saying. It still only sounds like 7 different songs being played at the same time. Like a failed Flaming Lips test. This band is so over-hyped! I don’t get them either. I think people like them because they are practically told to (no offense Aquarium, I love you). They must have a great publicist. They do have a great publicist. I understand your frustration with Animal Collective, particularly because I myself actively hated them until Panda Bear’s more recent solo record came out and served as a sort-of key to his group’s work for me. That being said, what I appreciate specifically about them is something that I think frustrates many people — they are exceptionally hard to understand. As a music critic, I’m constantly in a state of trying to understand music. Rendering music — a largely sensual, nonrational cultural good — through the intellect is a large temptation for me, and it wasn’t until I gave up trying to understand Animal Collective that I began to enjoy them. Thanks for your comments, though, and happy listening! After fully listening to the tracks I have of Merriweather Post Pavillion, I can conclude this: while I enjoyed it, the momentum did not appear to build. Not to say it wasn’t enjoyable, but the 9.6 it garnered from Pitchfork (maybe they messed up the score with Antony’s new album or Bon Iver’s new EP) does not seem deserved. My rating – 8/10. While better than solid, it lacks a certain element of momentum and cohesiveness. Definitely worth a listen, as it transcends genres. If you are looking for a band that will produce a record that deserves its rating on Pitchfork, wait for Wavves’s new album. They are the Women of 2009, wonderfully lo-fi indie rock. I would give them (unlike Animal Collective) at least at 9.6/10, if not 10/10. I have tried to enjoy past Animal Collective albums, but I never could find what was so great about them. The music was just too damn BUSY. MPP is different. I liked it almost immediately. This album has actual hooks and melody. The melodies are subtle and sometimes slightly hidden behind layers, but they are there. This time the hype is real, and I can see a possible Kid A-type of success with MPP. That is to say, its good enough to be viewed historically as a groundbreaking record while enjoying some commercial success. After listening to part of A.C. Newman’s new atrocity (I was appalled – I know he can perform at a more advanced level), the recurring thought of listening to Merriweather Post Pavillion is better than anticipated. i’m with Marty – dipped a toe into the AC with ‘Sung Tongs’ (easy to like, less so to love), picked up the scent with ‘Person Pitch’ and have been loving ‘MwPP’ – precisely because i can’t describe it (i can’t do that “‘artist a’ meets ‘artist b’ in weimar-era berlin on speed”-thing with it) but also because it’s about growing, settling down, seeing what’s real, etc – it’s a sister to ‘sounds of silver’ in that way – that sounded like the book of moses for thirty-somethings to me! What a beautifully written and well-conceived “review.” Closing it out with a David Byrne lyric was perfect. i want to like it. i really do. there’s something about it that’s new and energizing even if they sound like The Beach Boys. And yet, they do boggle the mind a bit. In some ways they are very simple, and yet the odd rhythms and time signatures throw me a bit. i like the album and will listen occasionally, but it won’t be on my heavy rotation. I respect it though.